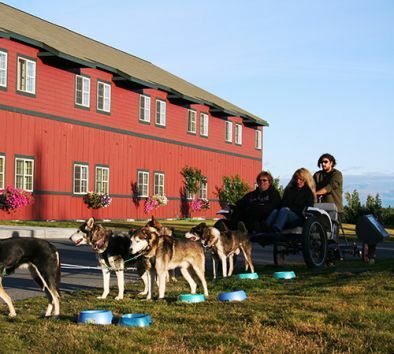 Step outside the Copper River Princess Wilderness Lodge and meet a local musher and his dog sled team to learn how dogs are kept in shape during the summer months. Long before the Iditarod became world-famous, Native Alaskans used dog sleds in their everyday lives to help survive the cold, haul food and pull heavy loads. During the Alaskan gold rush, dog sleds were required to bring much-needed supplies up over the mountain passes and glaciers. When winter is over, mushers use wheeled carts to keep their dogs fit for winter sporting events and for everyday transportation. After a brief demonstration, hop on board and experience the strength and enthusiasm of these dogs as you’re pulled through the wilderness. Maximum weight is 250 lbs. Tour operates outside of the Copper River Princess Wilderness Lodge. Guest must be able to walk from lodge waiting area to entrance. Wheelchair bound individuals may participate but must be able to transfer from their chair to the dog sled.